Imagine, if you will, a gigantic Religious Apologists Quilt, large enough to cover a football field, including the end zones. There are more than 6,000 squares—each a square yard—representing each of the religions of the world, past and present. For Christianity alone, because it has splintered endlessly, there aren’t enough squares on the entire field. Certainly, for example, the Baptist, Catholic, and Quaker brands cannot be the same religion. But let’s allot 500 squares to the quarrelsome Christians. The chief apologist for each religion stands in the middle of his or her square, having attained that privilege by possessing certainty about the faith—and being fiercely committed to defending it at all costs and against all critics. It’s their job, their profession, and they are not about to budge or waver. Skepticism is treason. But this privilege of standing on their patch of quilt—where they can’t help seeing all of the other apologists—never seems to provide a crucial insight to these defenders of the faith, one that is obvious to skeptics: they can’t ALL be right. Their slick, contorted, convoluted arguments in favor of their version of god would be laughed off the quilt by thousands of the other apologists. So, truth be told, each apologist on the Big Quilt is confident that all the other patches represent “collective delusion.” Well, of course, they wouldn’t say that. It’s dangerous for these pots to call the other kettles black; besides, it sounds better to say that “…there are different paths to the divine truth.” But who are they trying to kid? With just a little scrutiny we can see that this line is a diversionary tactic—and can’t possibly be correct. The Catholic apologists, for example, would concede that only tiny scraps of Islam have much claim to truth. Why is it so hard for devout folks to come to terms with the fact that religion is a function of the human mind? As far as we know, religion doesn’t afflict animal minds, and there is no evidence whatever that God is manipulating human brain cells—people aren’t actually channeling gods through prayers and vision—if so, there wouldn’t be thousands of other apologists on thousands of other patches. Wouldn’t an All-powerful, Omni-competent God have just one message—and the skills to prevent it from becoming so garbled in human brains? 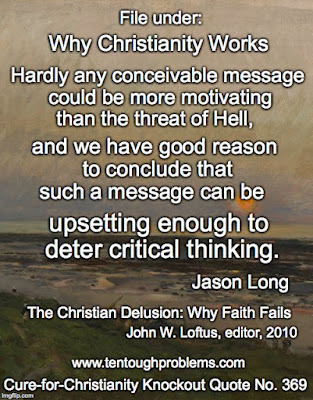 One of the most common frustrations for those of us who push back against Christianity is the massive ignorance among laypeople about what they profess to believe. Long asks: “How can these people believe they are enlightened enough to insist on the veracity of these outlandish beliefs when studies show that they know so little about them?” I suspect you’d get blank stares from most Christians if you ask them to explain the differences between Mark’s gospel and John’s. 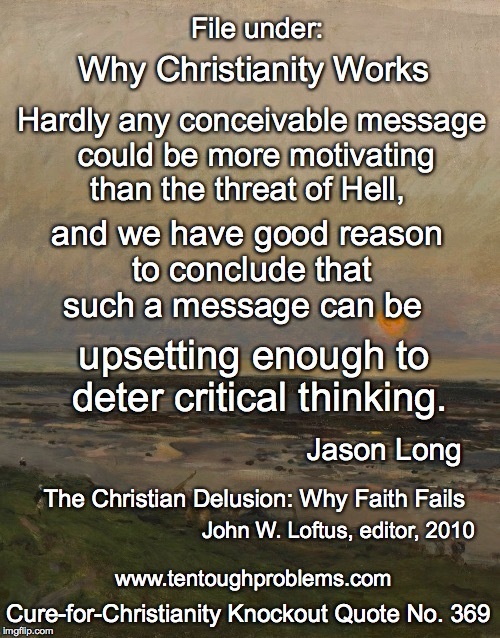 Long’s blunt description of the challenge of getting around the roadblocks put up by the brain to favor religion is based on his 2008 book, The Religious Condition: Answering and Explaining Christian Reasoning. Back to the football field and the Big Quilt. Let’s pack the stadium with a hundred thousand devout folks from hundreds of different religious traditions. Maybe we could screen for people who test well for curiosity. And there, right in front of them, is the absurd spectacle: thousands of dead-certain apologists, each one insisting that they possess superior god-knowledge—superior to all the others. Maybe this would be a first step in sparking suspicion that there’s a con game going on, and that skepticism isn’t treason after all.